Working on the musical performance of the beats of keyboard or drums, or both? If positive, then I’ve got the right tool that you need most right now. It’s a MIDI controller mini USB keyboard and drum set that I’m talking about. It’s a part of the MPK series from the brand and so far, it had been their most popular creation. Quit messing around with keys on the keyboard and see how you start to improve over time. With Akai mpk mini mk2 in hands, you will actually find your fingers exploring new melodies that you couldn’t have done with the piano rolls of your PC mouse. However, as an emerging and potential product with multiple significant purposes, we’ve decided to provide a hands-on review of this device. So, we gathered the device specifications, it’s features and the real-time data of how good this is. Finally, we’ve processed a large number of user responses in our way and here is the entire review. A pitch and joystick is quite a space-saving idea. 8 Drm pads with velocity sensitivity. 8 controlling knobs for tweaking or mixing. A tool for both professionals and beginners. Light in weight and easy to transport. Not a great plastic quality of the buttons. Not waterproof or spill proof or dust proof. Velocity settings on the keys cannot be adjusted. In this age of modernized music, instruments are getting more organized and available over time. Take this Akai mpk mini mk2 as an example. Technology would combine a keyboard, a drum set with controllers in a dimension of 12 inches only- that was even beyond imagination 10 years ago. And now look at you, you’re about to buy it with a couple of 100 bucks. It’s a tool for the musicians of both professional and amateur levels. Professionals can use it for everyday sessions, and beginners can get benefit with it by the versatility it offers. With keyboard and drum set combined together, it’s a great way to sharpen both skills of yours. When you have such a compact sized device in hands, you will be expecting it to work on touch. akai professional mpk mini mk2 review isn’t that much soft, but you can get through it easily as they are velocity sensitive. The music is all about beats, and as a player, you need to keep a trace of what’s being played. Instead of just playing the keys on one velocity note, this is a way better option. There are a set of other benefits as well. Go through the detailed review of the product you and we will tell them all. 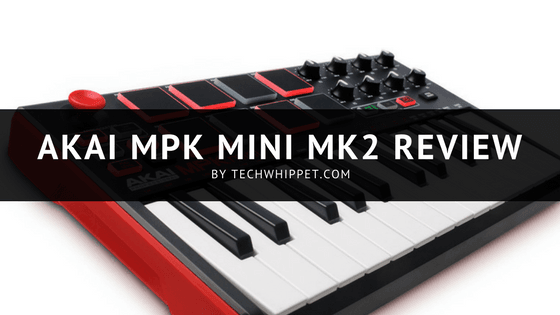 Akai mpk mini mk2 is a member of the series of Akai MP family and it’s the third inclusion. Firstly, there were the tidy and medium-sized MPK49 and now, then it progressed to a more featureful MPK29 and now it’s the MPK mini. What MPK49 was able to do is to squeeze a few octaves into a device of a few keys. And now in 2018, MPK mini has brought up a revolution of space saving design and become a miniature of a desktop ‘footprint’ right away. The installation of this USB device is simple and effortless. It requires no special driver to install and it supports all the operating system we commonly use. There is a software patch editor that seems to work fine on almost every PC configuration. As the device is powered by USB, it will get its power through a cable provided with the box. Come to the musical advantages that APK mini will gift you with. Firstly, it will store up to 4 presets of sound rhythms and you have to record each of them through a parameter. As like as the benefits, there are a few facts that need serious improvement from the manufacturer. Firstly, it’s the plastic quality of what the drum keys are made of. Users might be expecting something better. Secondly, it’s the way they’ve built it with no protection from liquid spills and dust. If you use it for long, this is the things that are going to happen to it. And in case you don’t clean both in and outside on regular basis, that is going to decrease the lifetime of this device. In the frontal interface of the device, you will find two buttons named the CC Button and the Prog Changed button. With the Prog Changed button, you can trigger sample or other instrumental sounds. And through the CC button, you can access two banks of 8 controllers of the device. In Akai mpk mini mk2, you will have 25 synth-action mini keys and a drum pad set of 8 velocity sensitive rubber pads. With such a combination of musical controllers, you can create any mood of music instantly without being in the recording studio. One of the most significant signature features of this device is it’s smooth and velocity responsive drumming pads. There are 8 soft pads for that purpose that are smooth and sensitive to touch. That makes it velocity sensitive and easy to play for both experienced and new players. Also, the glowing LED behind each of these pads will let you identify their locations even in darkness. That’s useful for those who are new to drums. Now come to the control knobs that are located at the right corner of the set. They are dedicated to providing the user a freedom of control over whatever they are composing with the keys of keyboard and pads of drums. The control knobs might look a little small to you, but what else can you expect in such a mini-sized device? The entire package includes a software platform for musicians named VIP. We’re mentioning this particularly because there are pretty recognition’s and awards behind this software platform that turned it to be musician’s one of the best software platform ever! It provides a hands-on control solution to musicians and composers. To have a better control over your musical performance, three more dedicated buttons are provided in the Akai mpk mini mk2. They are called the Program Change Button, CC Button and A/B banks for drum pads button. Also, at the backside of the unit, you will have a 1/4” sized sustainable pedal input to get compatible with any type of sustain pedal you know. When it comes to software environment for musicians, a relevant question is, does the software performs on all sort of platforms? Well, you will be glad to know the answers. This software and the device itself are completely okay will all operating systems like Windows, iOS, and Mac. So, if you own any of these three operating systems, this will be a plus for you. As you are looking forward to a mini-sized drum pad and keyboard controller, you must be carrying it around. And on that note, the 12.4 inches long and 1.6 weighing device will be a great plus to carry. It will fit inside any backpack and will not be heavy on you. Thanks for being until the very end of this entire akai professional mpk mini mkii review. Throughout the article, we tried our best to touch everything that a user like you might be concerned about. Starting from the size, features, and purposes, we provided even a set of awareness about the product. Hope you found t perfect and a right fit for your life as a musician and hope this kit will be a string assistance to your musical excellence!